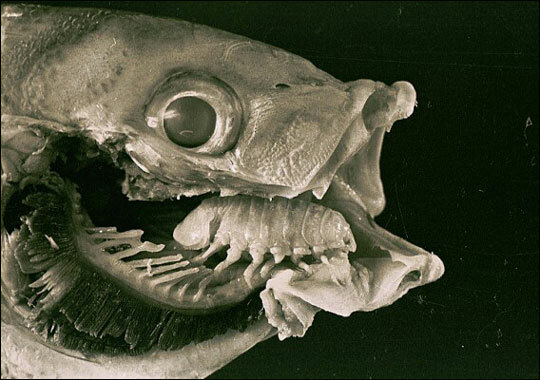 It’s like something out of Giger – Alien 5: Underwater. Didn’t they already make that? Or am I thinking of Giant Shark vs Giant Octopus? I have a deep suspicion there is a human version of this parasite that has gained lodgings within the mouths of some parliamentarians…. What, only this *week*?! I will have to try harder next time. Very apropos, I thought, for the City of Tongues. Nice – wish he’d plug my book. I don’t even think it’s all that foul or yuck, actually — at least it’s a symbiotic relationship (of sorts) and doesn’t kill the fish, although I must say it does remind me of some of the human relationships I’ve known. You want foul, what about those parasitoid wasps that lay their eggs inside the flesh of living caterpillars so that after the cute little wasp larvae hatch they can eat their way out, killing the host in the process? Nature, what are you gonna do. You call that yuck? THIS is yuck.